Designed as a Work of Art for Discriminating Buyer who appreciates Exceptional Quality in a Smaller home. OCEAN & GOLF COURSE VIEWS! SINGLE STORY. OVER $400,000 IN EXTENSIVE RE-DESIGN BY Maligosia Migdal. Magnificent 10 3/4 High Front Entry Doors Custom Made by Local Artist Robert Feeley. Silicon Bronze Cladding with Bronze Grill Work Encased Around Steel. Temperature Controlled Wine Room. 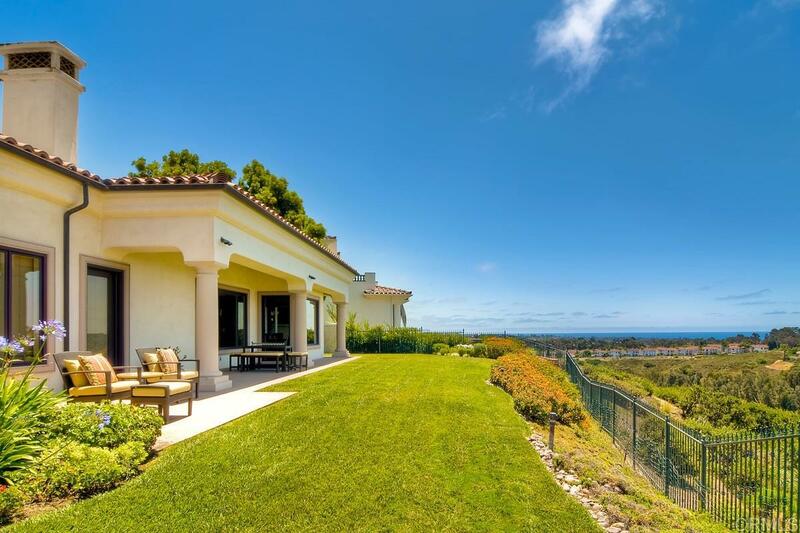 MOVE IN READY!, Custom Mediterranean Single Level Masterpiece Located in Prestigious Aviara Point. Walk to the Park Hyatt Resort from this Prime Property Overlooking the Arnold Palmer Golf Course and PACIFIC OCEAN. Extensive Crown Molding, Venetian Plaster Walls, American Walnut Flooring, Gourmet Kitchen with Viking and Fisher & Paykel Appliances. Handsome Fireplaces in LR and FR. Luxurious Master Bedroom and Bath. Two private Guest Suites. Ample Storage. VIEWS, VIEWS, VIEWS!! No Expense Spared on the Interior Design of this Exceptional Home!